This has been quite the week if you’re Vladimir Putin. You watched Donald Trump sow chaos at the NATO summit in Brussels. Then you met with Trump in Helsinki and had him defend you by lying to the world and (wrongly) throwing his own intelligence agencies under the bus. Then you were invited to the White House. Yep, it was a great week if you’re Vladimir Putin. If you’re anyone else, it was a deeply alarming week. Donald Trump denied Russian interference in our elections multiple times this week, and he seems oblivious to the fact that Russia is attempting to again interfere in our elections. Last Friday, Director of National Intelligence Dan Coats said, “the warning lights are blinking red again,” referring to Russia’s current attempts to interfere in our elections and comparing the feeling in the intelligence community to that during the lead up to the terrorist attacks of September 11th, 2001. Yet the president who appointed these two officials seems unwilling to believe their assessments. Instead of denying these facts, Trump should be working to secure our democracy. That’s what a leader would do. Unfortunately, we are left with a deeply disturbing conclusion: We cannot trust President Trump to put our national security before his own political interests. 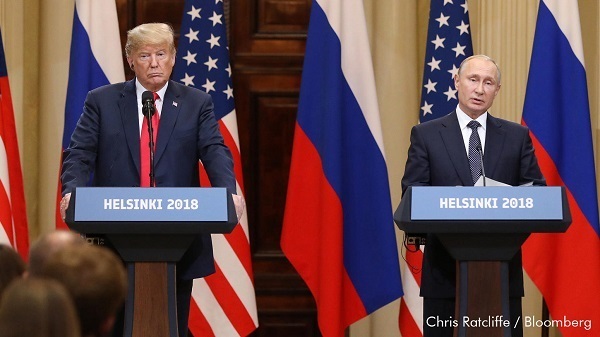 This week, House Republicans refused to renew election security funding, and Senate Republicans refused to vote on a resolution supporting the intelligence community’s assessment that Russia interfered in the 2016 election to help Trump. It’s time to replace congressional Republicans with leaders who will stand toe to toe with Donald Trump and keep him from further threatening our democracy. We’re doing that right here in Washington, and there are several seats we’re working hard to flip from red to blue. Please make a contribution now to help us elect patriotic Americans who will fight tooth and nail to stop the president from dismantling our democracy. 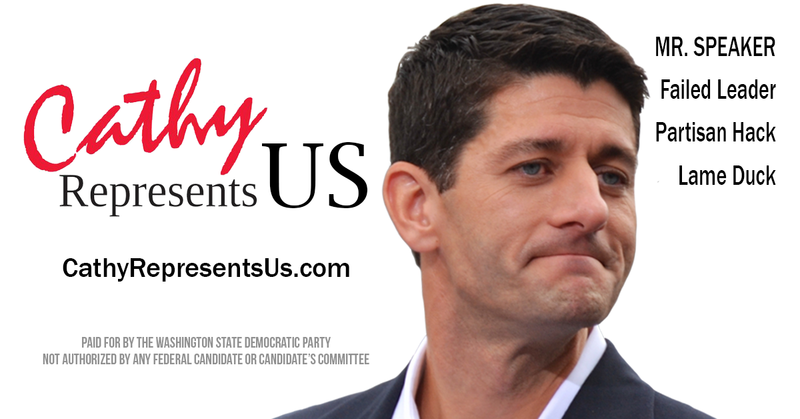 It came to our attention that Cathy McMorris Rodgers wasn’t telling the whole story about who is backing her campaign. In fact, with all the billboards popping up in Eastern Washington, you’d think she has vast army of women supporting her. That’s not the case. 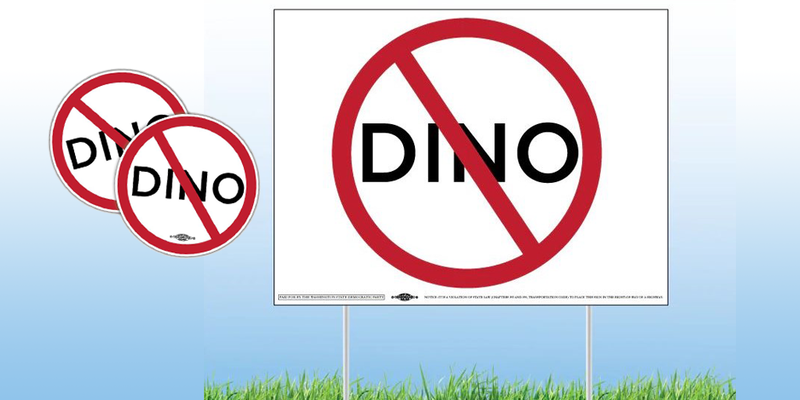 So in order to make her billboards more honest, we remade them. 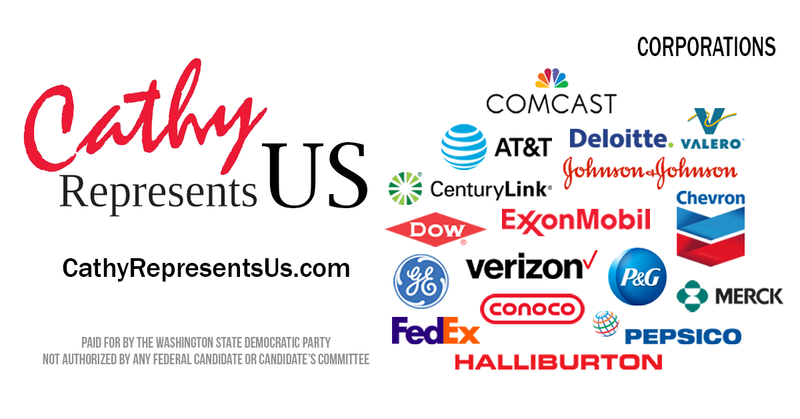 Check out our new website devoted to showing who it is Cathy truly represents: corporations, DC insiders, special interests, the ultra-wealthy, and others who have given her enough money to win her favor. Make sure to share the website with others! One of the questions we’re asked most is, “What exactly does the state party do?” So we made a video to explain what we do and how we’re organizing for the 2018 elections. Check out the video, and please share it! 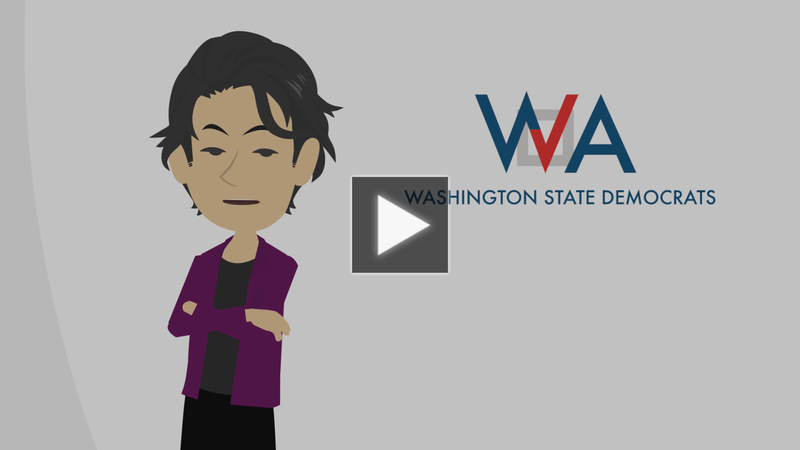 As the cartoon version of our chair Tina Podlodowski says in the video, the Washington State Democratic Party is the only entity in the state whose mission is to elect Democrats up and down the ballot. And we’re working hard everyday to get out tens of thousands of votes for Democrats. You can help us reach as many voters as possible by making a contribution. We’ve opened offices and hired organizers all over the state, but we need your help to keep up the pressure. On Monday we got out the word that Ferry County was the only county in the state that was not planning to put prepaid postage on ballots sent to voters for the primary election. Thanks to the quick response from our team, an article published in the Spokesman-Review, and your calls into Ferry County, the county auditor has reversed her decision and will now be including prepaid postage with each ballot. We’ll pass on more information as it becomes available! State Senator from the 44th LD Steve Hobbs is calling on his opponent to return a check from Peter Zieve. Republican Doug Roulstone accepted the check for $1,000 last weekend, according to a report filed with the state's Public Disclosure Commission. Zieve, who has been fined for using discriminatory hiring practices, has openly espoused anti-Muslim views, calling Muslim refugees "terrorist savages" in emails to employees. Doug Roulstone also has a history of controversial stances on race from his run against Congressman Rick Larsen in 2006. Steve Hobbs said, "Peter Zieve and his hateful views on our Muslim neighbors should have no place in our politics or in this campaign." He called on Roulstone to return or donate the money from Zieve. Want to show everyone that you really do care about the family separations going on at the southern border and that you intend to use your vote to do something about it? You might like our sticker modeled after Melania Trump's jacket, but with a much better message. Check out our official online store to get your swag today! We'll be updating the store regularly so keep checking back! 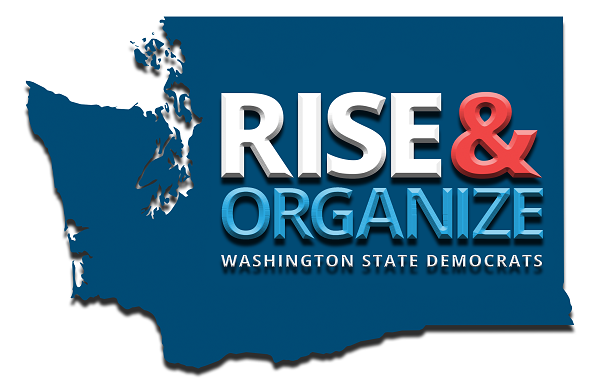 It's more important than ever to solidify the progress we've made in Washington State and work to take back our country. But there is a lot of work to do in the coming months.